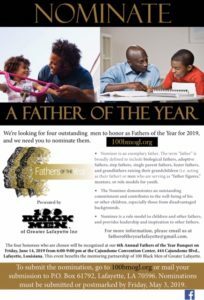 The 100 Black Men of Greater Lafayette, Inc., and Alpha Phi Alpha Fraternity would like for you to think of men like this and nominate them to be a 2019 Father of the Year. The Fathers and Father Figures comes from all walks of life; a father, grandfather, uncle, brother, coach, teacher, pastor, police officer, elected official or any man who is an exemplary father. Please use the link below to nominate a deserving Father. Nomination will close on May 3, 2019. Nominate a 2019 Father of the Year Here!